Considered as the most effective, yet also one of the most underutilized digital marketing tactics today is email marketing. For most marketers, they tag e-mail marketing as the most effective tactic because it allows them to establish a more personalized relationship with their customers as well as to save significant cost and time in their marketing efforts- all of which said to be more challenging to do or attain if done using other digital marketing tactics. That said, while the focus of many marketers has been on improving subscriber engagement amid declining email click rates, the importance of list growth has also become more nuanced in the past recent years. In the latest report from Ascend 2 that was featured on Marketing Charts, it was revealed that increasing sign-up conversion rate is the most important goal (55%) and is the most challenging objective to achieve (46%). The same report also revealed the email list growth tactics that 89% of 255 marketing influencers around the world considered the most effective in helping them achieve the said goal. 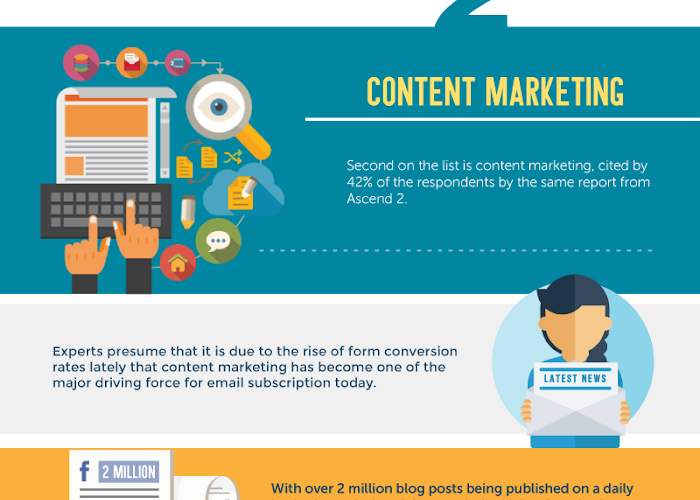 To know more of these methods, we discuss in this infographic the seven most effective tactics that should help you grow your email list today.